Last week I was amused by something serious. Yes, I was amused because that’s how some of us can get by the daily shenanigans we come across in Nigeria else your blood pressure could hit the roof if you get overly worried. A certain Philip Obin was in news for the wrong reasons. The Nigerian ‘TwitterVille’ was dotted with his mentions for allegedly selling a handle @APCNigeria for $2000. That came after the ruling All Progressives Congress, APC, disowned the verified Twitter handle following an embarrassing claim of subtle overtures made by former President Goodluck Jonathan’s aide Reno Omokri. 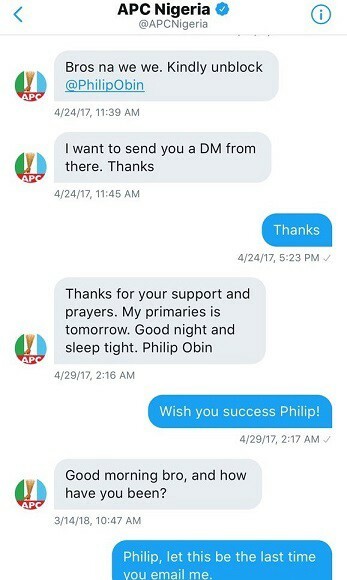 Apparently, Mr. Obin who owns the handle had been covertly interacting with Omokri -a sworn enemy of the APC- for God knows why. Unfortunately, this is not the first time we ‘ve been treated to similar drama. I recollect that sometime in 2016, the Party had distanced itself from the same Twitter handle after it tweeted congratulatory messages to the former Senate President Senator David Mark on his victory at the Benue South Senatorial rerun election. But it seems a red line has been crossed with this latest incident as the party’s recent statement made it clear that even after several appeals to relinquish the handle, Mr. Obin declined and has continued to misrepresent the party with his tweets, it then warned that it “is now left with no option than to take other lawful actions to restrain Obin from further embarrassing the Party”. While we await the ‘lawful actions’ by the party the handle continues to tweet even as I write. Now let’s not forget that the APC and many like Mr. Obin have enjoyed a mutually beneficial relationship for over three years. He was prominent among the thousands of youth volunteers who flooded the social media during the 2015 election campaign. The party had little qualms about the information he was dishing out then whether it was verifiable or conjectural. As a matter of fact, some of the information was passed on by the party and government spokespersons. 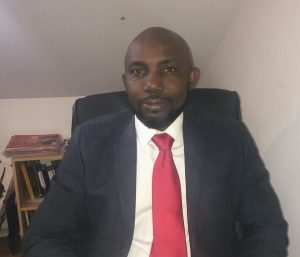 Mr. Obin himself leveraged on the position to propagate his personal business, often sending bulk messages to thousands of Nigerians about his so-called ‘digital entrepreneurship programme’. He is also an aspirant for the chairmanship position of Biase Local Government Area of Cross River State on the party’s platform and garnered a number of supporters among the electorate. It may not be wrong to say that this is a young man who obviously knows that packaging more than substance is just about 90% of what is required to cajole a majority of the Nigerian electorate. I believe that his interactions with Omokri who himself was once embroiled in an impersonation scandal were personal, the informal tone also leaves the impression that they are friends. But of course, the more experienced self-acclaimed pastor in his usual manner capitalised on that to publicly ridicule the APC. The issue reveals the inherent ethical chasm in our social media sphere where any individual smart enough to gather a few thousand followers by rambling daily is branded ‘an influencer’. I will elaborate further. You may wish to take a cursory look at the number of twitter followers on Professor Adesanmi’s handle, then compare the figure with that of the two subjects here and you will begin to get the point I’m trying to make. It is especially galling that in the Nigerian appraisal formula, the informed tweets of an erudite University don who is a sought-after speaker across the world somehow ranks lower than those of Omokri and Obin who represent the opportunistic mercantile politicking that pervades our political landscape. It is also a shame that the ruling party hitherto had no official social media pages. That alone speaks volumes about its media and communications office. Does it mean that they don’t acknowledge the millions of Nigerians who interact and get informed via social media platforms daily? Yet they insult our sensibilities by quoting mind boggling figures for ‘website upgrade’. You now have an insight into the leadership of our political parties. They are predominantly populated by analogue and facetious individuals unwilling or should I say incapable of appreciating the many opportunities offered by this digital era. Of course, I know that a large majority of the electorate are not on social media but one cannot depreciate its impact on public discourse and communication in the society. It is cross-cutting and exponentially beneficial in extracting contributions from intellectuals including those in the diaspora. The APC will do well to sanitise its public relations machinery. Much as the main opposition has also failed in that department I believe that the wise words of former President Goodluck Jonathan should guide the ruling party going forward. You may win an election with propaganda but you definitely cannot govern with it. Like someone aptly stated, “ APC news does not exceed twenty-four hours before you get a rebuttal”. The ruling party owes it as a duty to properly communicate its activities and that of the government to Nigerians. It is hoped that with the announcement of its new website and social media accounts, Nigerians will begin to witness a new era of synergy between its raucous media offices. It is only then that we can effectively interrogate the party’s position on the numerous socio-political issues plaguing the country. Previous article Why it’s so hard for women to ‘just leave’ abusive relationships. Next article From death to life.